We were only able to spend one day in Savannah, but we were able to do quite a bit of sightseeing in that one day. Savannah is known for its moss-draped squares, hidden gardens and antebellum properties. 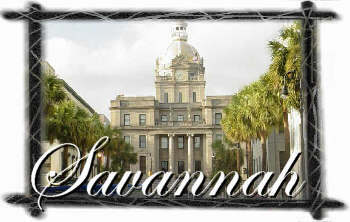 Founded in 1733, Savannah is the oldest city in Georgia. Click on any small image to see the full picture and read more about that picture. Savannah is laid out around a group of one block parks, or squares. Not all of the original squares still remain, but the ones that do contribute to the beauty and historic atmosphere of today's Savannah. You can take a walking tour (which is what we did) or simply drive around the city, stopping at old buildings and reading about their history. The squares were laid out somewhat in the form of the old English towns. Savannah City Hall - looking down the street from Johnson Square you have a wonderful view of the City Hall. Me sitting at the fountain in Johnson Square. Johnson Square is notable for being the first square laid according to General James Oglethorpe's design, which today includes 21 preserved squares and the fragments of two others. In the center of the square is an obelisk memorial to General Nathaniel Greene. His monument in Johnson Square was dedicated by the Marquis de Lafayette during his triumphant visit to Savannah in 1825 and Greene's remains were exhumed and re-interred beneath the monument in 1902. The original name of Telfair Square was St. James Square after the square in London. It's the fourth of oglethorpe's original four squares. The oldest art museum in the South, the Telfair Museum of Art is an important regional and national resource of the arts, culture, and history. Me, standing in Telfair Square across the street from the Museum of Art. Trinity United Methodist, the "Mother Church of Methodism" has moved back in, following an enormous and devastating fire in 1991 Barnard Street on Telfair Square. George Washington plaque stating that he was a guest in the inn here. Columbia Square marks the eastern limit of Savannah when it was a walled city between 1757-90. Bethesda gate, one of six city gates, was on this square. Today it is a tranquil spot away from the busy commercial district. The fountain in the center is from Wormsloe. Several hauntings have been reported here, you can take a night "ghost tour" of Savannah.